Farmer Health is the website for the National Centre for Farmer Health (NCFH). The Centre provides national leadership to improve the health, wellbeing and safety of farm men and women, farm workers, their families and communities across Australia. The NCFH has been operating since November 2008 and was officially opened by the Victorian Premier on 10 July 2009. The Sustainable Farm Families™ (SFF) program – a health promotion program which addresses farmer health, wellbeing and safety issues. The core message of SFF™ is that the most important aspect of a healthy Australian farm is a healthy farm family. A Victorian Travelling Fellowship which examined overseas models for working with agricultural populations and provided the five key strategic areas which have been adopted by the NCFH. The National Centre for Farmer Health will continue to build on the industry-service-government-academic partnerships developed initially through the Sustainable Farm Families™ program. The Centre will address the health, safety and wellbeing issues associated with farming and develop timely, appropriate and effective interventions. Professional training and education – providing undergraduate, postgraduate and continuing education for health professionals, including GPs, nurses, allied health practitioners, vets, agronomists and associated primary industry personnel. Applied research and development ¬– expanding the evidence base for effective interventions to improve farm and agricultural workers’ health. Web based information and services – increasing knowledge and understanding by providing links to quality information and in future by providing e-learning and telemedicine services. AgriSafe™ clinics – introducing innovative occupational health and safety services to farm and agricultural workers. Sustainable Farm Families™ programs – maintaining the farmer health programs with an increasing emphasis on the dissemination of research results from the programs. The National Centre for Farmer Health is a non-profit organisation, funded through the Victorian government’s Future Farming Strategy and the Helen and Geoff Handbury Trust. The Centre has successfully applied for a number of research grants for specific projects. The National Centre for Farmer Health does accept occasional commercial sponsorship for research or service delivery purposes, however is governed by a strict conflict of interest policy through Western District Health Service. All funds generated by the National Centre for Farmer Health, for example from the Safety shop or from providing educational services, are used to support further research. Farmer Health does not host commercial advertising, however the Centre does accept commercial sponsorship in some instances. When sponsorship funding is accepted it does not influence the Centre’s research protocols or outcomes. Sponsorship information is displayed separately from clinical information. Medical and health information on Farmer Health aims to provide summary information which is specifically targeted to the needs of farmers. Each topic page also provides researched links to further information which may also be of interest to health workers and researchers. Content is written and further research is conducted by an experienced medical writer and editor. The website is also overseen by an Advisory Group; see below under Governance. 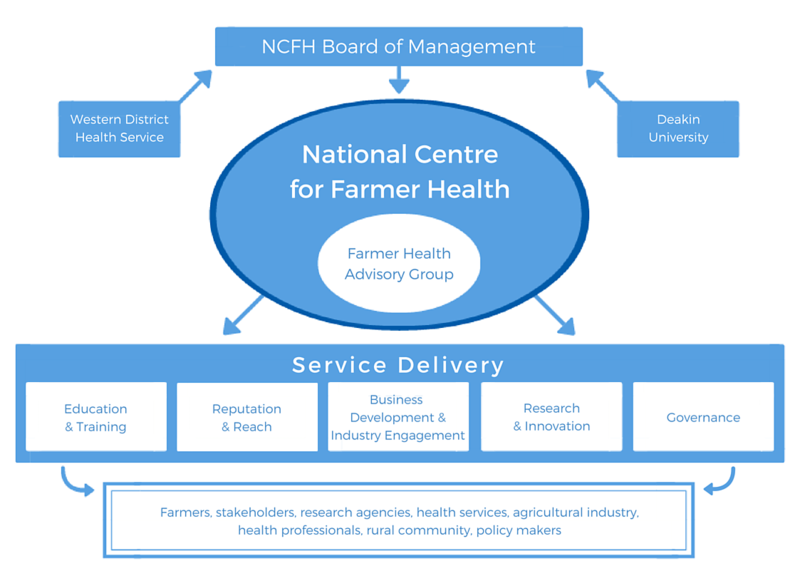 The National Centre for Farmer Health is overseen by a Board and each of the five service elements are also guided by an advisory group. See below under Boards and Advisory Groups. The Director of the National Centre for Farmer Health, Professor Susan Brumby, integrates a highly experienced multidisciplinary team of academic, health, social and industry professionals. While the National Centre for Farmer Health is a partnership between Western District Health Service and Deakin University, the Farmer Health website is owned by Western District Health Service, ABN 47 616 976 917. Prior to commencing with the NCFH Sue was Director of Community Services at Western District Health Service (WDHS). In this position she oversaw the introduction of new programs and innovative service delivery models resulting in numerous awards for service excellence, consumer involvement and health promotion. 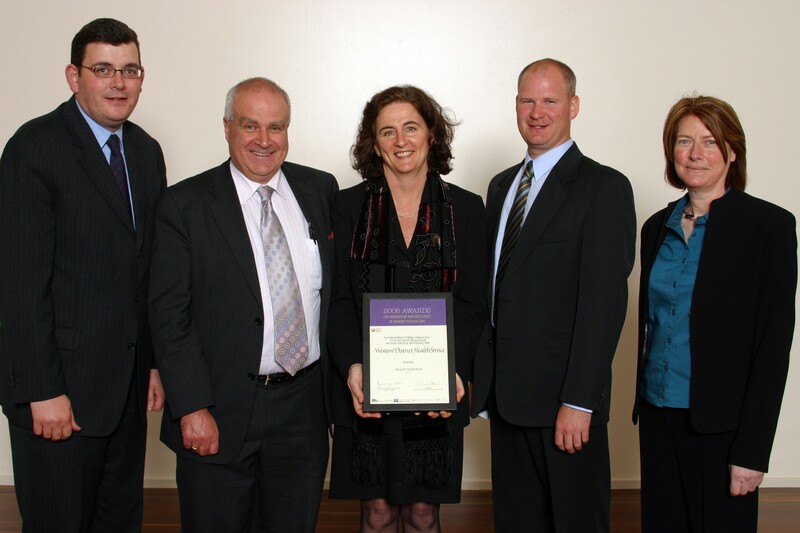 2014 – Vice Chancellors award for Excellence in Teaching and Learning for Agricultural Health and Medicine from Deakin University. 2013 – Awarded Overseas Study Program to the USA. 2006 – Awarded the Victorian Traveling Health Fellowship to study farmer health and decision making in the USA & UK. 2005 – Rural health professionals award (Barwon SW Region) for her outstanding contribution to the health of the community. Alison is a Behavioural Scientist who has lived and worked in Victoria’s rural farming community for the past 15 years. Her doctoral research explored the impact that suicide & accidental death have on members of Australian farming families. Alison’s role at the National Centre for Farmer Health (NCFH) since 2010 has included research addressing alcohol misuse in farming communities (Alcohol Intervention Training Program), rural suicide prevention and suicide stigma reduction (The Ripple Effect www.therippleeffect.com.au), and increasing the understanding of rural women’s experience of managing tough times (From Inside the Farm Gate). As a community educator, Alison has worked as part of the ‘Look Over the Farm Gate’ campaign—delivering health and wellbeing workshops to farmers and community members across areas of Victoria experiencing tough times. She also regularly presents to community, health professionals and industry groups on issues of farmer health, wellbeing and safety. 2013 – American Association of Suicidology ‘Seeking Hope’ Dissertation Grant. 2016 – Chancellor’s Research Medal, University of New England. 2018 – Suicide Prevention Australia, Emerging Researcher LiFE Award, recognising excellence in suicide prevention. A busy wife and mother to two boys, she is an Ambassador for Gen8r Change and recently retired from the Board of Management for Combined Preschools of Southern Grampians. She enjoys keeping fit and healthy and loves to spend quality time with her family on the weekend. Cecilia is enjoying expanding her knowledge of farmer health and making a difference to farmers’ lives by providing excellent support to the Director and the team in achieving our mission. Dr Richard Lunz is a South African trained doctor with experience in science/research/education and postgraduate degrees in Primary Care/Public Health/Occ Med/Aviation/Safety and risk joins NCFH for a return role after initial work with AgriSafe for a project support position. Tam is a Registered Nurse and lives and works with her husband and three children on their grain and sheep farm in Glenthompson – Western Victoria. Her passion for farming and the desire to improve farmer health and the health of the communities they support has inspired her to pursue postgraduate studies in Health Promotion and Agricultural Health and Medicine. Tam works with the National Centre for Farmer Health (NCFH) to deliver their unique AgriSafe™ program, providing farmers, families & agricultural workers with industry specific health and safety assessment and clinical screening. Other RN responsibilities for Tam include the delivery of Sustainable Farm Families Program and co-ordinating portable delivery of convenient Health & Lifestyle Assessments to agricultural agencies and associations nationwide. Jessie grew up on a beef farm outside Albury-Wodonga. She actively participated in many sports, in particular horse riding, netball and tennis. Following a gap year working in England she moved to Melbourne to study at Deakin University. In 2016, Jessie completed her Bachelor of Public Health and Health Promotion/Bachelor of Commerce majoring in Accounting. Subsequently, she then completed Honours in Public Health and Health Promotion in 2017, focusing on physical activity and motor skill performance of children in playgrounds of varied design. This led to working as a Research Assistant in Deakin’s Institute for Physical Activity and Nutrition focusing on children’s physical activity within schools. Jessie is looking forward to being a part of the terrific work the NCFH does and living and being a part of the Hamilton community. Dip Bus. M’ment, Cert IV Rural Bus. Tracey joined NCFH in 2009 and worked as Data Coordinator until June 2014 and re-joined the NCFH team in March 2016 as Program and Data Coordinator. Tracey and her husband live and work on their sheep and cropping farm in Western Victoria and in the Wimmera. Tracey is passionate about the health and wellbeing of our farming communities nationwide and works with the NCFH team to deliver their award winning Sustainable Farm Families™ program, developed to bring better health, wellbeing and safety to our people on the land. People who have already been involved with the program have been able to implement changes on the farm that have potentially life-saving consequences. This drives Tracey to promote all farm families and rural and regional health agencies to be involved. Tracey is also responsible for coordinating data and specific NCFH projects to ensure successful delivery and reporting of service targets are met. Morna is a Registered Nurse, and works with her husband on their sheep and cattle grazing farm in Gazette, Western Victoria. She is also actively engaged in Country Fire Authority (CFA) and Landcare roles within her local farming community. Morna works with the National Centre for Farmer Health (NCFH) to deliver their Health and Lifestyle Assessments (HLA) nationally, as well as the AgriSafe™ program at Penshurst District Health. These programs provide farmers, farming families & agricultural workers with customized health and safety assessments and education. Morna also delivers the innovative, interactive “Gear Up for Ag™” programs to young agricultural students empowering the next generation to identify hazards on farms and proactively manage their safety. Morna loves swimming and bike riding to keep fit. She also loves planting trees on the family farm to encourage biodiversity and shelter for stock. Samantha joined NCFH in March 2016 as the Online Communications Coordinator. Samantha keeps our website and social media up to date while sharing the vision of Farmer Health both nationally and internationally. Samantha has her own business in web design and understands the local needs of farmers and the community and love collaborating. She also has a strong passion for photography and a history in photo journalism. Originally a Melbourne girl who married a country boy and couldn’t imagine being anywhere else. Rowena grew up on a small farm in Byaduk. A busy mother of three busy children she is passionate about public health and nutrition and is currently studying a Bachelor of Health Science (nutrition and health promotion) through Deakin University, graduating mid-2019. Rowena enjoys playing hockey and social tennis, reading and photography and is pleased to be supporting the NCFH team as an administration data clerk. Corrina joined the team back in 2012 as a Receptionist and Casual Data Clerk. She has continued with our team as a Casual Data Clerk for many years while studying a Bachelor of Early Childhood Education with Deakin University, to follow her passion for teaching Kindergarten and Primary children. She grew up in the Western District and has raised four children in Hamilton. Always happy to help our Data Team when the need arises. Dr Rahman is a Public Health Specialist and overseas trained Medical Doctor. He joined NCFH with the experience of working in public health research and programs, both in Australian and overseas settings. He had been working as a Senior Research Fellow at Australian Catholic University for the last four years prior to commencing his role at NCFH. Dr Rahman completed PhD in Public Health from the University of Adelaide, Master of Public Health (MPH) and Bachelor of Medicine and Surgery (MBBS) from Bangladesh. He is trained on advanced Epidemiology from Australia, Europe and USA. Dr Rahman’s research track record includes work on behavioural risk factors for prevention of communicable and non-communicable diseases, cardiovascular diseases in particular, tobacco research, health promotion, health system research, work with Aboriginal, disadvantaged and rural population. He has experience of managing public health programs in developing countries and engaging multicultural communities to improve health and wellbeing. He is also experienced in teaching public health and epidemiology. He has been supervising higher degree research students and three of his PhD students have already graduated. As a Senior Research Fellow of NCFH, Dr Rahman will play the key role in offering research leadership, contributing significantly to the research outputs, mentoring research staff and students, promoting research links with collaborators, contributing to relevant programs to improve health and wellbeing of the farmers, and thereby, improving the profile of NCFH.